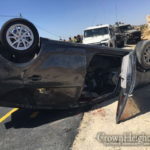 Six Palestinian Arabs were killed on Sunday morning and four others were seriously injured when a minibus and a truck collided on Highway 90, near Petza’el in the Jordan Valley. One of the injured died later. Firefighters rescued the victims, who were trapped in one of the vehicles. 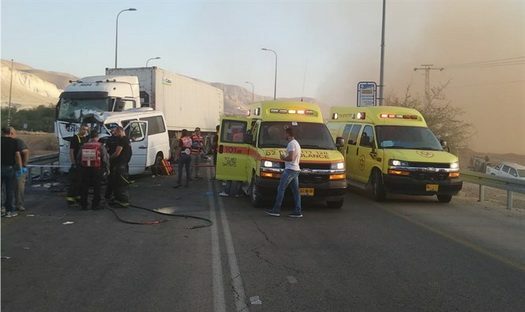 Magen David Adom paramedics, alongside IDF paramedics, treated the victims who were airlifted to the Tel Hashomer Hospital, Beilinson Hospital in Petah Tikva and Hadassah Ein Kerem Hospital in Jerusalem for further treatment. 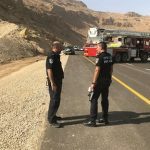 Last week, eight members of the Atar family from Psagot were killed in an accident on Highway 90 in the Dead Sea. 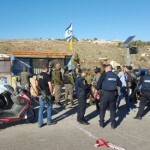 The victims were Yariv, 45, Shoshi, 47, and their children Yaakov Yisrael (12), Ateret (11), Ayala (9), Moriah (7), Yadid (5) and Avigail (3). The drive who hit the Atar family’s car was arrested and a court extended his remand. Police suspect that he had been driving under the influence of drugs. The driver stated during his interrogation that he sometimes uses medical marijuana. Forget the Pally Psycho Death Cult terrorists. Going strictly by the numbers the most dangerous thing in Israel is a moving car!